The Lonely Dell Ranch is located in the Glen Canyon National Recreation Area at Lees Ferry, Arizona. The ranch served as the homesites for those that worked on the ferry. Lonely Dell sits a short distance from the Paria River near its confluence with the Colorado River. The ranch was built in 1871 by Mormon pioneer John D. Lee, a practicing polygamist, who built cabins there for two of his families. Lee was executed in 1877 for his role in the Mountain Meadows Massacre whereupon the Mormon Church bought the rights to the ferry and granted them to Warren Marshall Johnson and his families who took up residence at Lonely Dell. 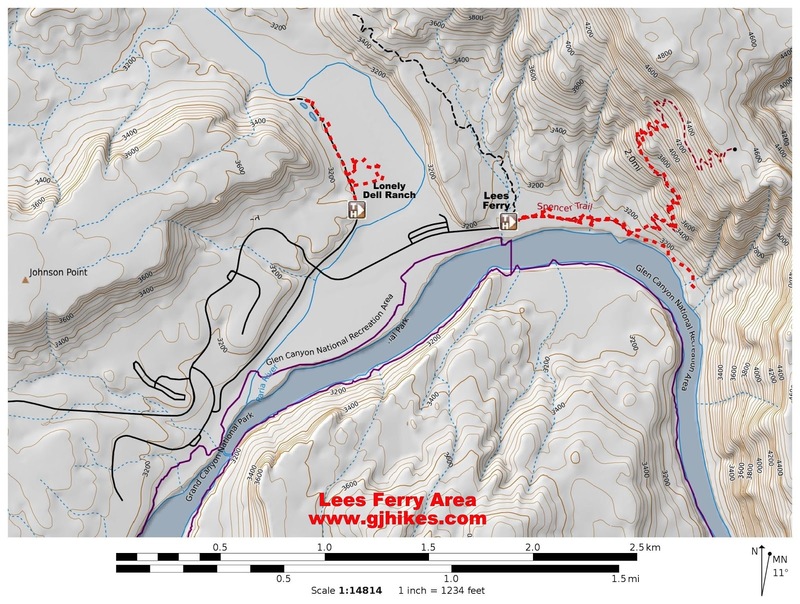 To get to the trailhead follow the directions for Lees Ferry. Just before crossing the Paria River watch for the sign for the Lonely Dell Ranch. Follow the gravel road the short distance to the trailhead parking area. From the parking area it is a short walk down the road to the ranch. At times there are brochures available at the trailhead that can be purchased for $1. The various buildings are located just past the orchard. Many of the original implements still remain around the ranch. They appear as though someone will come along at any moment and put them into service as though nothing had changed since they were last in use. Due to the remoteness of the Lonely Dell Ranch every bit of food that they needed had to be grown for survival. The trees in the orchard still bear fruit that can be freely picked by visitors when it is in season. The trees include apples, apricots, plums, peaches and pears. There is a 5 gallon limit per person per day. A number of picnic tables can be found scattered around the ranch. Continuing further down the road leads to the 'Picture Window Cabin'. A pioneer cemetery can be found a short distance past the cabin. Graves here date from 1874 to 1933. We snacked on a few apricots while walking through the orchard but left the rest for the locals to pick. The peach trees hadn't been thinned so the peaches were only slightly bigger than the apricots. It is doubtful that the trees get sprayed so it probably qualifies as organic fruit which is just the way it would have been almost 100 years ago. Since these fruit trees only live 20-40 years the Park Service or someone else must have replanted the orchard at some point. If you happen to be in the Lees Ferry area and have the time you might find the Lonely Dell Ranch worth a visit. 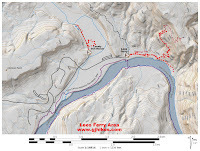 Or if you like to take in as many sites as you can that are on the National Register of Historic Places you will find 3 of them at Lees Ferry to mark off your list. If you would like to see it for yourself then all you have to do is 'Take a hike'.